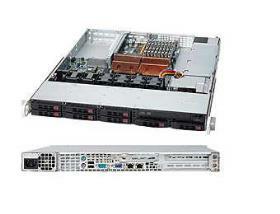 Acme AGD-108TF 1U Opteron 6200/6300 server. AMD Opteron 6400/6300 with 1U rackmount black. AMD SP5100 (RAID 0, 1, 10) controller supporting 6 ports SATA-2. (option to add SAS 6Gb controller, like 8-port, to control more hard drives). 1U RackMount case with 600W power supply. 8 of 2.5" HDD bays, SAS/SATA hot-swap, backplane included. Width: 17.2 in. Height: 1.7 in. Depth: 23.5 in.